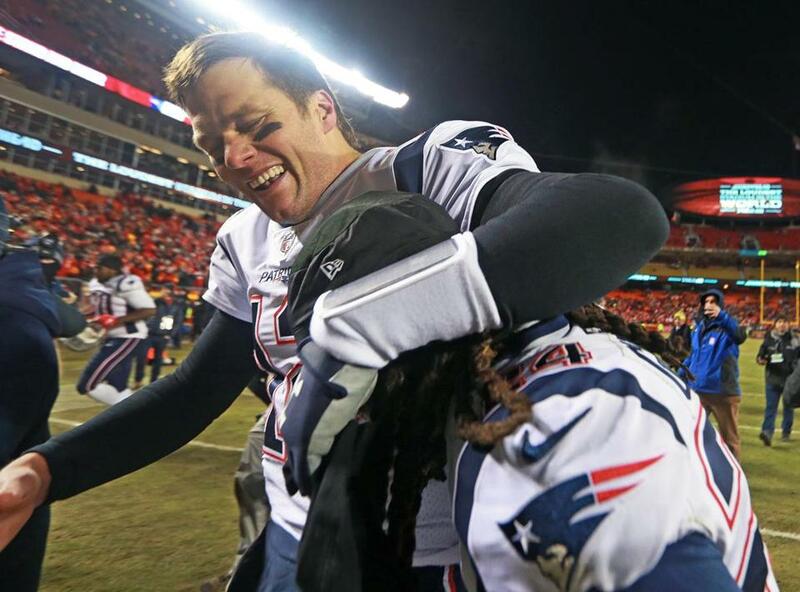 Tom Brady hugs Stephon Gilmore after the win. For the third straight year, the Patriots are going to the Super Bowl. 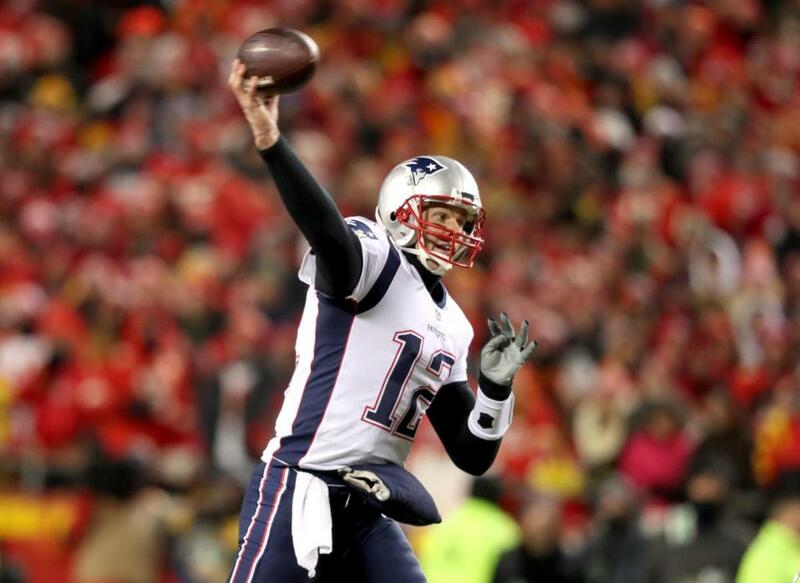 Tom Brady keyed a 75-yard touchdown drive on the first possession of overtime to give New England a 37-31 victory over the Kansas City Chiefs in the AFC Championship Game on Sunday. It was the 12th game-winning drive of Brady’s postseason career. He is now 29-10 in the playoffs, including 3-0 in playoff overtime games. New England is the first NFL team with three overtime victories. Brady finished 30-of-46 passing for 348 yards, a touchdown, and two interceptions. The Patriots had 524 total yards of offense, went 13 for 19 on third down, rushed for 176 yards, averaged 5.6 yards per play, went 4 for 5 in the red zone, and had the ball for 43 minutes, 59 seconds. The Patriots are just the third team to advance to three straight Super Bowls, joining the 1990-93 Bills and 1971-73 Dolphins. New England will face the Los Angeles Rams in Super Bowl LIII on Feb. 3. 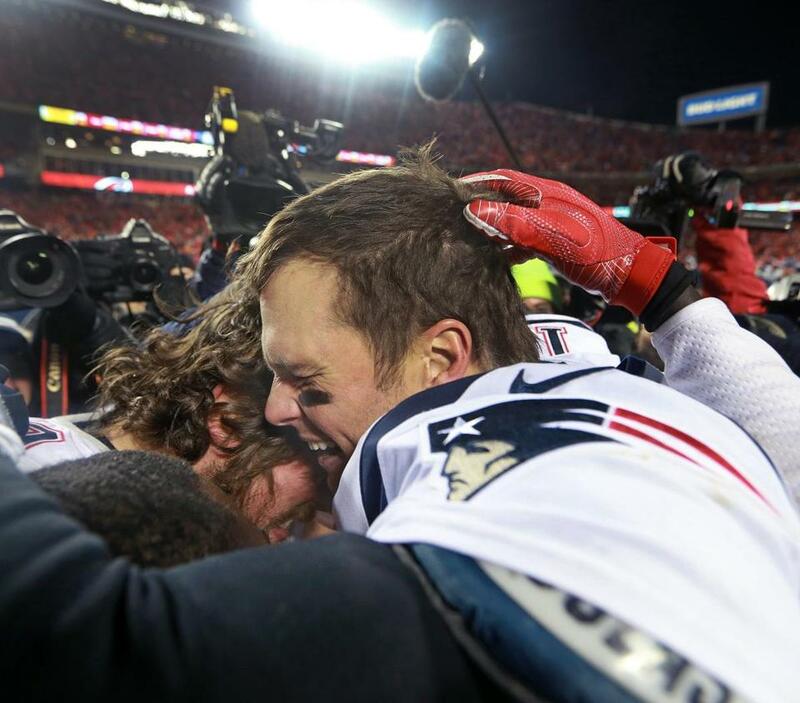 It will be New England’s 11th Super Bowl appearance, and fourth in the last five years. Bill Belichick: “You just got to give all the credit to the players. 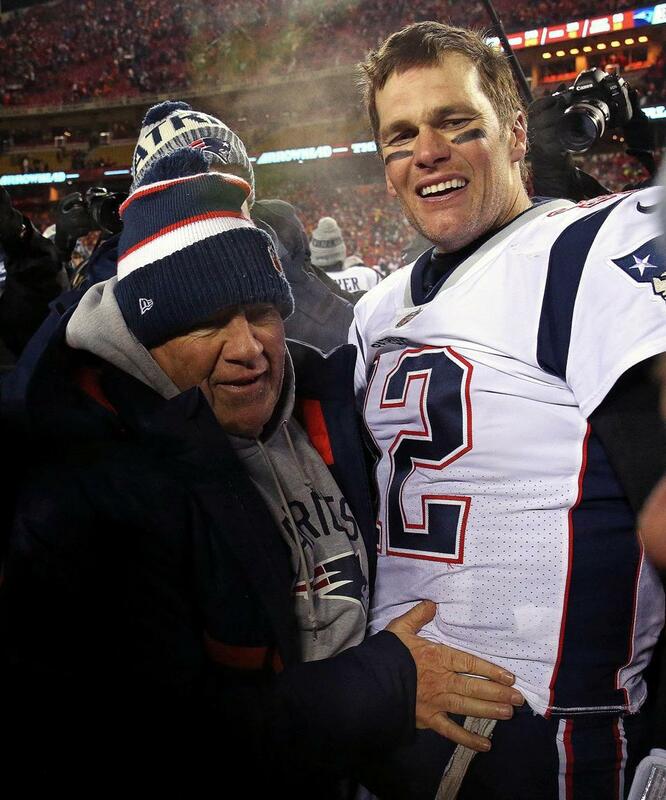 Bill Belichick and Tom Brady hug after the win. 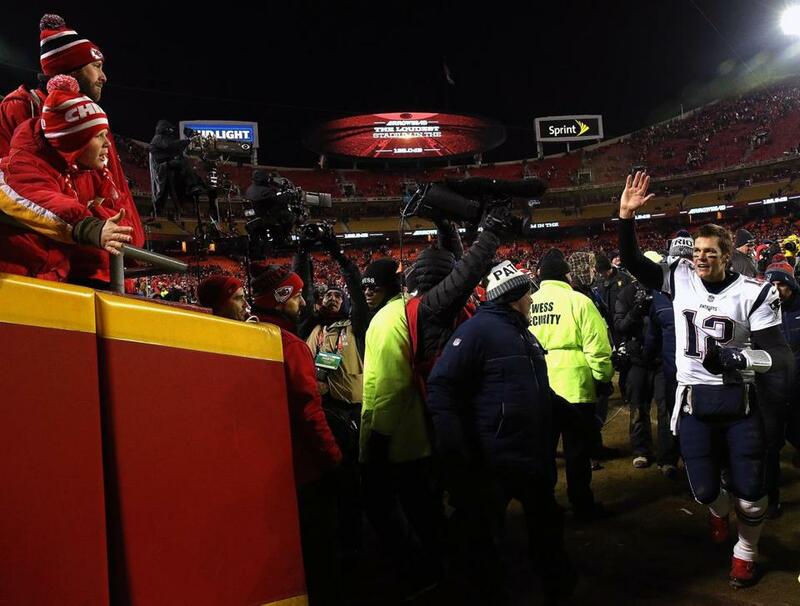 Tom Brady waves as he leaves the field. Brady hugs center David Andrews after the victory. 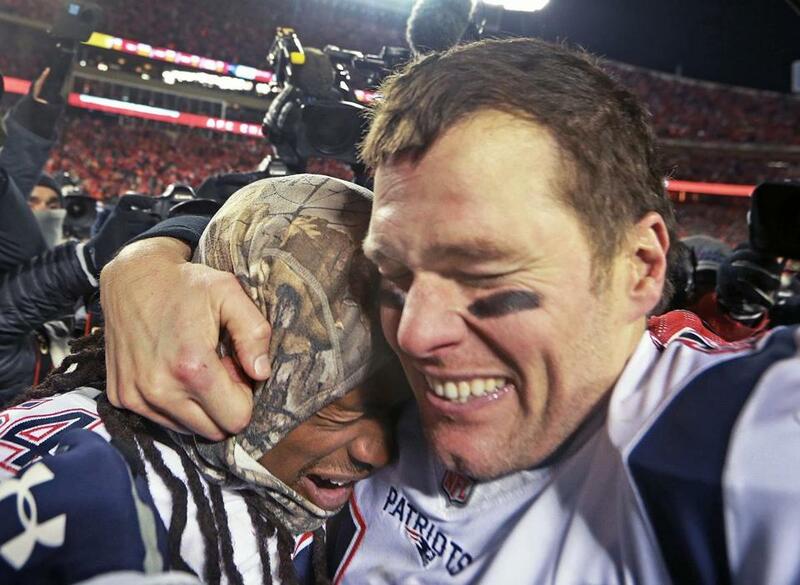 Tom Brady hugs Dont’a Hightower after the win. 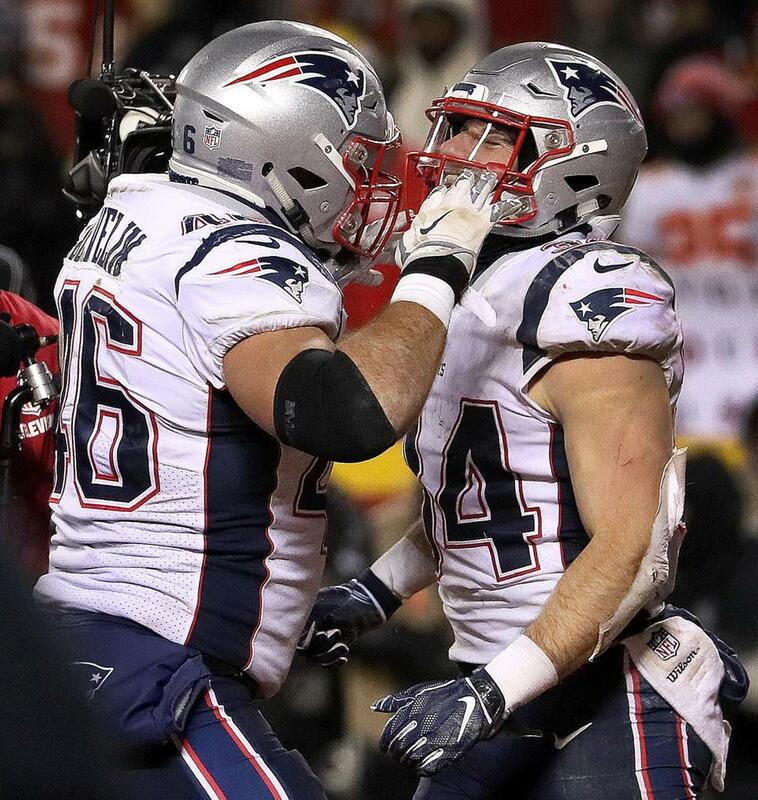 James Develin and Rex Burkhead celebrate after Burkhead’s game-winning touchdown. Running back Rex Burkhead backs into the end zone for the game-winning touchdown. Tight end Rob Gronkowski (87) celebrates his reception for a first down on the game-winning drive. Julian Edelman finished with seven catches for 96 yards. Tom Brady completed 30 of 46 passes for 348 yards, a touchdown, and two interceptions. Below are updates from the game as it unfolded. Patriots 37, Chiefs 31: Rex Burkhead sent the Patriots to Super Bowl LIII with a 2-yard touchdown run. Tom Brady found Chris Hogan along the sideline for 10 yards on the first play of the drive. Two incompletions later, the 41-year-old fired a pass to Julian Edelman across the middle for 20 yards on third and 10. The pair connected once more two plays later — this time for 15 yards on third and 10. The Patriots needed 10 yards on third down again after two more incompletions, and they got it. Brady hit Rob Gronkowski in stride for 15 yards, then handed off to Burkhead three straight times. The running back ran for 10 yards, then three yards, then the game-winning touchdown. #Patriots win the toss and will get the ball to start OT. The 17 4th quarter points by the Chiefs were tied for the second most against the Patriots in the playoffs, behind only the Panthers in SB XXXVIII and the Colts in the 2007 AFC Championship Game. Postseason OT different than regular season. Basically start a new game. 15 minute quarters. Both team?s get a possession unless TD or safety scored on opening possession. Three timeouts per half and all replays initiated by booth. Patriots 31, Chiefs 31 (0:08): Kansas City kicker Harrison Butker split the uprights on a 39-yard field goal to send the game to overtime. Patrick Mahomes threw two deep passes to put the Chiefs in field goal range. First, he found Spencer Ware for 21 yards. Then, on the second play of the drive, Mahomes hit Demarcus Robinson in tight coverage for a 27-yard gain that set up Butker’s try. Tom Brady took a knee to end regulation. Patriots 31, Chiefs 28 (0:39): Rex Burkhead scored a 4-yard touchdown to give the Patriots the lead back. The score was set up by a 25-yard catch by Rob Gronkowski. New England went 65 yards in six plays. Chiefs 28, Patriots 24 (2:03): Damien Williams put the Chiefs back in front with a 2-yard touchdown run. The score was set up by Sammy Watkins, who took a Patrick Mahomes pass 38 yards to the New England 2-yard line. The Patriots looked to have caused a turnover when their defense picked up a fumble early in the drive, but cornerback J.C. Jackson was whistled for defensive holding and the Chiefs kept the ball. Jackson was flagged again one play later, this time for pass interference 23 yards from the line of scrimmage. On the following play, Mahomes launched the ball downfield and Patriots cornerback Jonathan Jones couldn’t hang on to a potential interception in the end zone. Patriots 24, Chiefs 21 (3:35): On fourth and 1 at the Chiefs 10-yard line, Sony Michel took the handoff from Tom Brady, sprinted through a hole created by James Develin, and burst into the end zone for a touchdown. The Patriots’ 10 play, 75-yard drive was highlighted by Chris Hogan’s incredible one-handed catch over the middle for 11 yards on third and 8. Andy Reid challenged the call on the field, a completed catch, but the ruling was upheld after review. Chiefs 21, Patriots 17 (7:45): Damien Williams turned a short Patrick Mahomes pass into a 23-yard touchdown as the Chiefs made the most of the turnover. The score came on the second play of the drive, after Bill Belichick threw his challenge flag on the first. The officials ruled that a would-be 7-yard connection to Sammy Watkins was incomplete. Patriots 17, Chiefs 14 (8:06): Julian Edelman’s fingertips were involved again moments later. This time, Tom Brady’s pass slipped off those fingers and into the waiting arms of Daniel Sorensen, who took the interception 22 yards to the New England 23-yard line. Patriots are -2 in turnovers. They?re 1-3 in playoff games since 2001 with a turnover differential of at least -2. Patriots 17, Chiefs 14 (8:39): There was a lengthy review after Julian Edelman appeared to have touched the football as he muffed Dustin Colquitt’s punt. 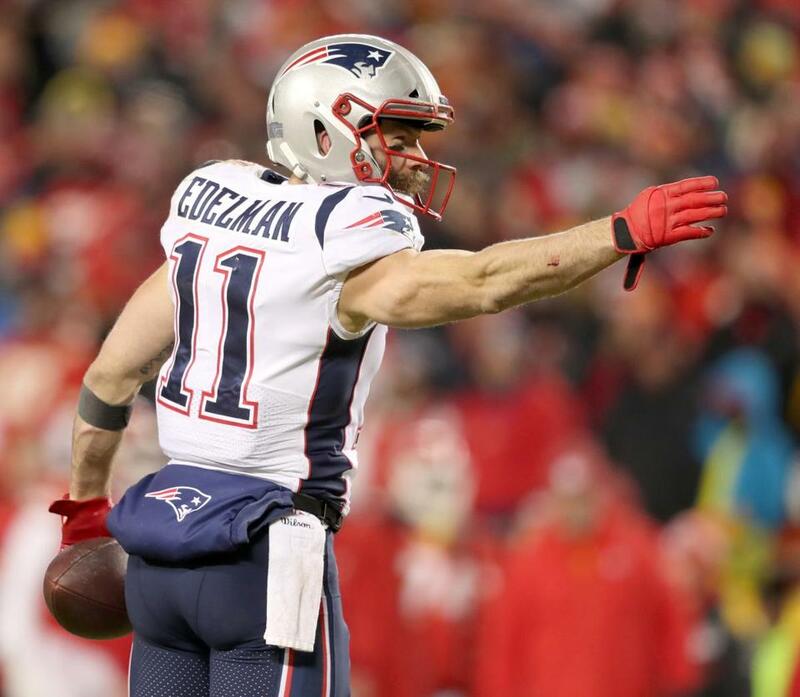 The officials initially ruled that the Chiefs had possession at the New England 26-yard line, but after review they determined Edelman had not touched the ball. The overturned ruling meant the Patriots kept the ball. Patriots 17, Chiefs 14 (9:38): Kansas City stuffed Rex Burkhead on fourth and 1 at its own 25, giving the ball back to Patrick Mahomes and the offense. That wasn't close. Don't get that call one bit. Totally agree you go for it there, but Burkhead? Use Develin, have Brady sneak it. McDaniels has made some great calls but that was not one of them. Tom Brady and Co. had driven 51 yards before going for it, and Sony Michel set a new high for carries in a game (26). Brady started the drive with a 19-yard completion to Julian Edelman. The Patriots also picked up first downs through Sony Michel, who fought for 10 yards on second and 9, and James Develin, who caught a 9-yard pass on second and 7. Patriots are over 120 yards. They?re 10-0 this year when rushing for 100+. Patriots 17, Chiefs 14 (14:51): Patrick Mahomes connected with Damien Williams for a 1-yard score. The touchdown, which was set up by a pass interference call on J.C. Jackson, capped a nine-play, 75-yard drive. Mahomes dove for a first down on third and 1 to keep the drive alive early, then watched Williams take a short pass 33 yards. 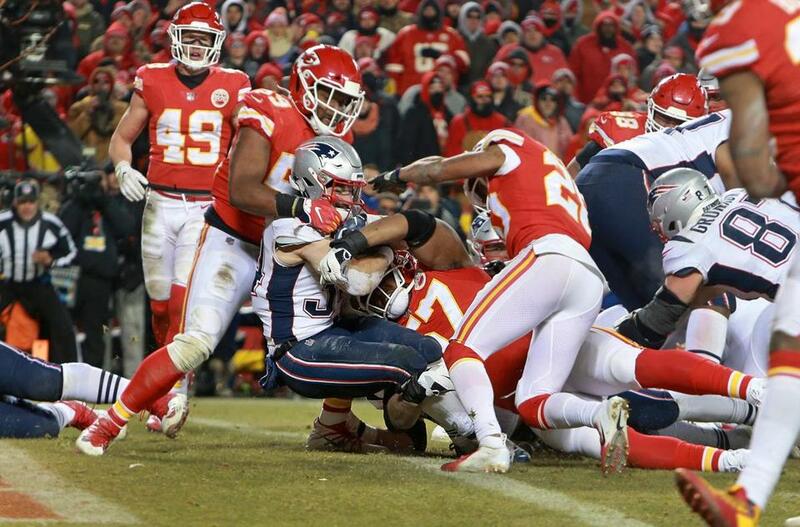 The Chiefs drove to the New England 14-yard line, where Mahomes looked for Travis Kelce in the end zone and Jackson was flagged for PI. Three quarters down, the Patriots have only allowed 176 yards and 9 first downs. Patriots 17, Chiefs 7 (4:07): Stephen Gostkowski made a 47-yard field goal to convert the short field position into three points for the Patriots. Tom Brady connected with Chris Hogan for a first down on the second play of the drive, before Phillip Dorsett was flagged for offensive interference. 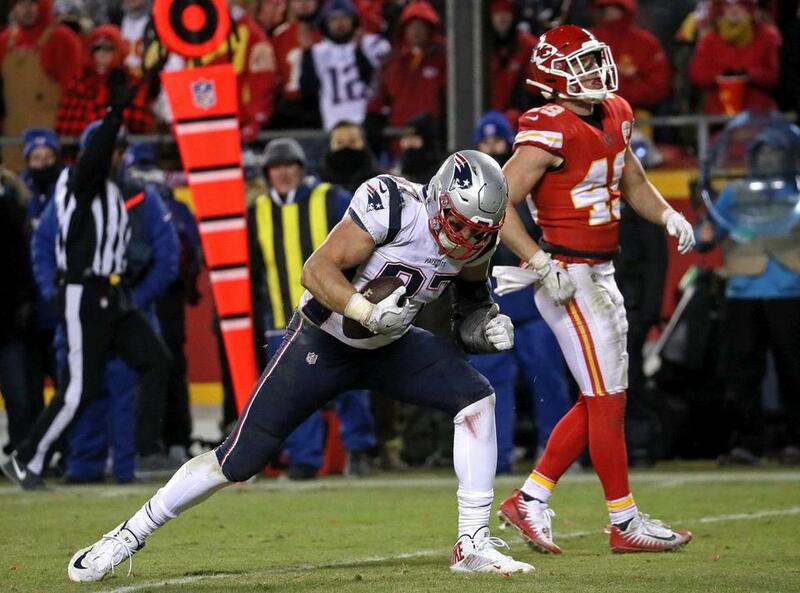 Patriots 14, Chiefs 7 (7:44): Facing third and 18 after a false start penalty and a sack by Patriots defensive end John Simon, Patrick Mahomes threw an incomplete pass intended for Chris Conley that was broken up by Jason McCourty. Damien Williams ran for 10 yards and a first down on the second play of the drive before the penalty on guard Cameron Erving and Simon’s sack wiped out much of the gain. Julian Edelman returned the punt to the Kansas City 37-yard line. Patriots with 4 sacks, tied for the second most sacks of Mahomes this year. Chiefs starting this drive at the 3. If you are a momentum person, they've got it. Still haven't moved the ball consistently or methodically. Patriots 14, Chiefs 7: The Kansas City defense came up with a stop on third and 6 when defensive end Chris Jones got a hand to Tom Brady’s pass intended for Rob Gronkowski. Ryan Allen booted a 43-yard punt. Tyreek Hill tried to make a play, but lost 11 yards. The Chiefs were also flagged for an illegal block above the waist, moving them back to the 3-yard line. 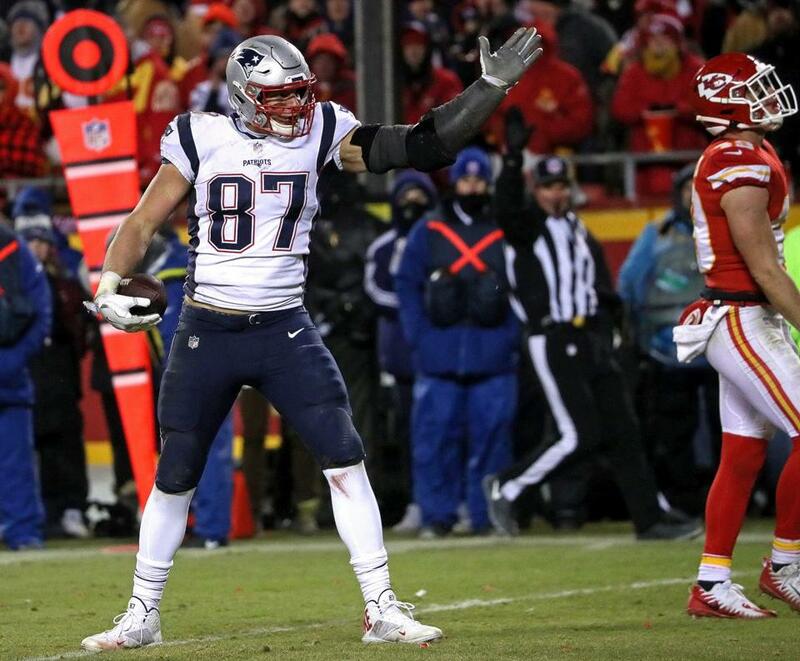 Patriots 14, Chiefs 7 (12:56): Patrick Mahomes threw a 12-yard touchdown pass to Travis Kelce to cut New England’s lead. The score was set up by a 54-yard completion to Sammy Watkins. The Chiefs went 74 yards in four plays. The throw to Watkins, who beat Patriots cornerback Stephon Gilmore, came on third and 2 at the Kansas City 34-yard line. Patriots 14, Chiefs 0 (0:00): Kyle Van Noy strip-sacked Patrick Mahomes for a 10-yard loss. Mahomes jumped on it, running out the clock. Patriots 14, Chiefs 0 (0:27): Tom Brady hit Phillip Dorsett for a 29-yard touchdown to cap off an eight-play, 90-yard drive. James White had a 30-yard catch-and-run off a screen pass, bringing his yardage total to 64. Patriots 7, Chiefs 0 (3:14): Kansas City had its best drive of the game, with Patrick Mahomes getting out of a tackle to complete a 12-yard pass to Sammy Watkins and then tossing one 42 yards to Tyreek Hill. But it went for naught. Mahomes overthrew a wide-open Damien Williams on first and 10 from the 23 that would’ve been a touchdown, Williams was then stuffed after just a 1-yard gain, and Trey Flowers sacked Mahomes for a 14-yard loss, which knocked the Chiefs out of field-goal range. 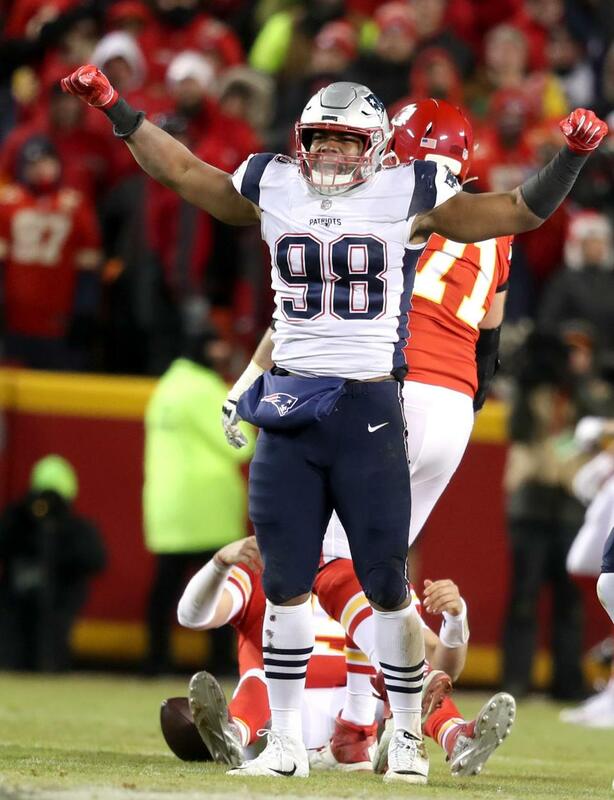 Trey Flowers celebrates his first-half sack of Patrick Mahomes. Now we're seeing Keion Crossen on Tyreek Hill. Patriots putting their fastest corners on him. Patriots 7, Chiefs 0 (7:45): Sony Michel was stuffed for no gain on third and 1, and although the offense briefly stayed on the field, the unit then subbed out and the Patriots punted it away. James White, who has four touches for 20 yards, had an absurd 9-yard catch on third and 7 earlier in the drive. Patriots 7, Chiefs 0 (12:08): Kansas City couldn’t do much with Reggie Ragland’s interception, going three and out. Patriots defensive tackle Malcom Brown stuffed running back Damien Williams for no gain on third and 1. Patrick Mahomes failed to connect with tight end Travis Kelce on first down, then found him for nine yards on the following play. The Chiefs gained nine yards on the drive and still sit at minus-2 total yards. Dustin Colquitted boomed a 59-yard punt, which Julian Edelman returned to the New England 26. That was a lovely punt, but it shouldn't have taken place. Patriots 7, Chiefs 0 (13:45): Reggie Ragland picked off a Tom Brady pass in the end zone to put an end to New England’s drive. It was Brady’s first postseason interception since that pick-6 against the Falcons in Super Bowl LI. Fourth time in his playoff career that Brady has thrown a pick from inside the opponents' 5-yard line. It hadn't happened since the Jan. 2008 AFC Championship game. He'd never been picked in his career from the 1. Tom Brady had thrown 237 postseason passes without an interception before that one, an NFL record. Time of possession in the first quarter was NE: 12:38 and KC: 2:22. Patriots 7, Chiefs 0 (4:43): Kyle Van Noy sacked Patrick Mahomes for a 14-yard loss on third and 10, forcing Kansas City to punt after six plays. Mahomes did not complete either of his pass attempts on the possession. Patriots cornerback Jonathan Jones was whistled for defensive holding on the drive. The Chiefs lost 11 yards on their opening drive -- their most negative yardage on any drive this year. The previous low was a -5 yard drive. Jonathan Jones has been on Tyreek Hill so far but just got flagged for holding. Remember the Patriots played 100% penalty free when they beat KC in Week 6. Patriots going small to open the game. 4 CBs, Jonathan Jones (v fast) on Tyreek Hill. Stephon Gilmore on Sammy Watkins (like Week 6). Patriots 7, Chiefs (6:55): Sony Michel scored from a yard out, following a big block by James Develin. It was an ideal start for Tom Brady and the offense. They marched 80 yards in 15 plays and ate more than 8 minutes of clock. Patriots are 19-4 in playoff games under Belichick/Brady when scoring first, including 8-0 in the last six playoff years. Michel, the rookie running back, set himself up for the score with an 11-yard rush. Brady went to Gronkowski on the third play, a 13-yard completion. James White converted two third downs, a five-yard gain on third and 4, then a two-yard gain on third and 1. Brady also went to Julian Edelman on third and 7, good for a 14-yard gain. 10 rushes on the Patriots opening drive are tied for the second-most ever in a game started by Tom Brady, behind only a 13-rush opening drive vs Detroit in 2002. Previous high in a Brady-started playoff game was 6, set last week vs the Chargers. New England’s offensive starters: QB Tom Brady, RB Sony Michel, FB James Develin, WR Julian Edelman, TE Dwayne Allen, TE Rob Gronkowski, RT Marcus Cannon, RG Shaq Mason, C David Andrews, LG Joe Thuney, LT Trent Brown. The Chiefs won the toss and elected to defer. Tom Brady and the Patriots’ offense will start with the ball. 1. If Patriots win the toss, they should take the ball first. Really need to play from ahead today. Patriots quarterback Tom Brady warms up. 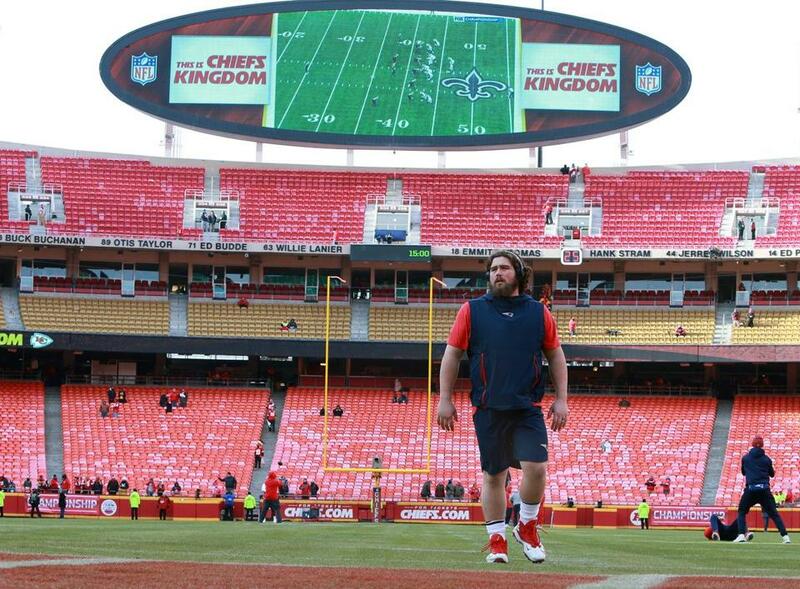 Before the game, Patriots center David Andrews was on the field in shorts while the NFC Championship game was being shown on the screen behind him. 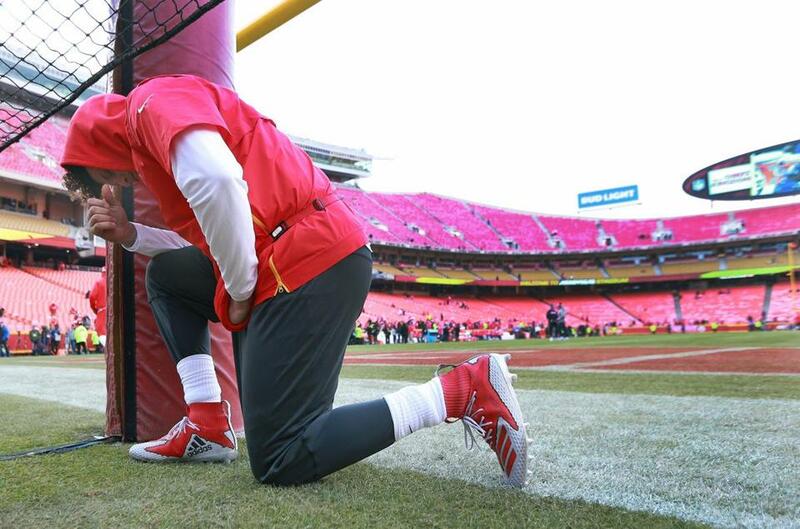 About two hours before kickoff, Chiefs quarterback Patrick Mahomes came onto the field, jogged to an end zone goal post and knelt down in prayer. 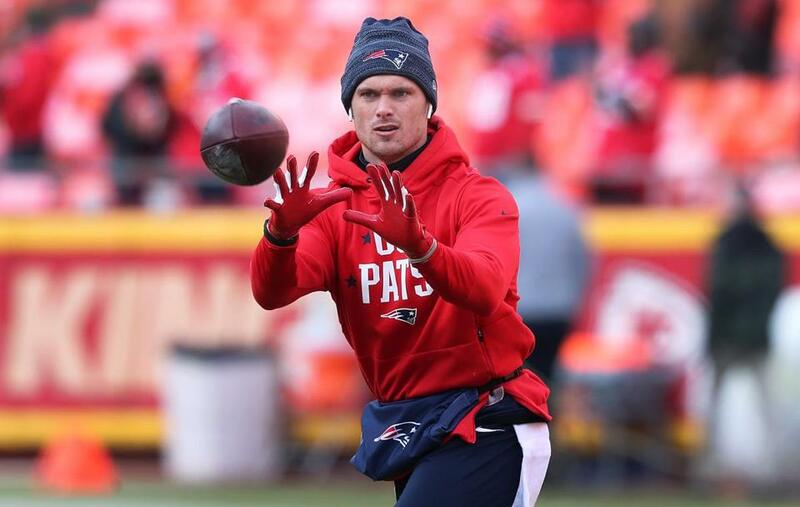 Patriots receiver Chris Hogan was out warming up a couple of hours before kickoff. Hogan (15) goes through his pregame workout. 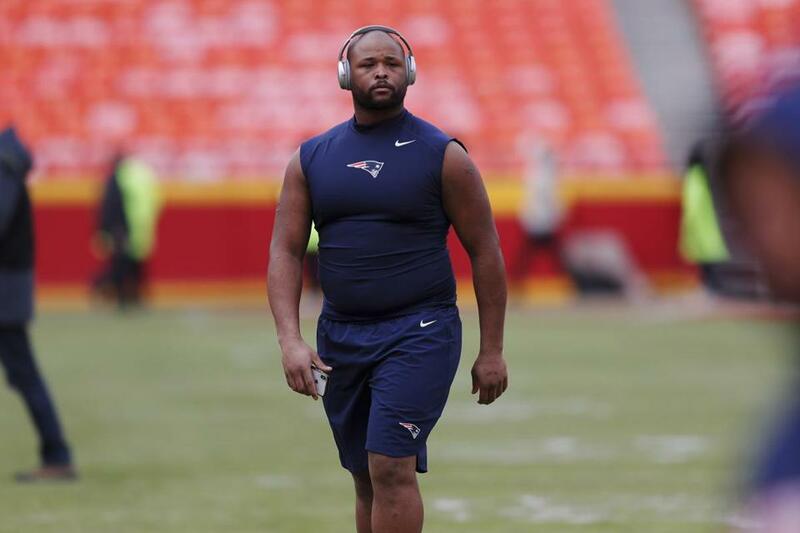 Patriots offensive tackle Marcus Cannon warms up. 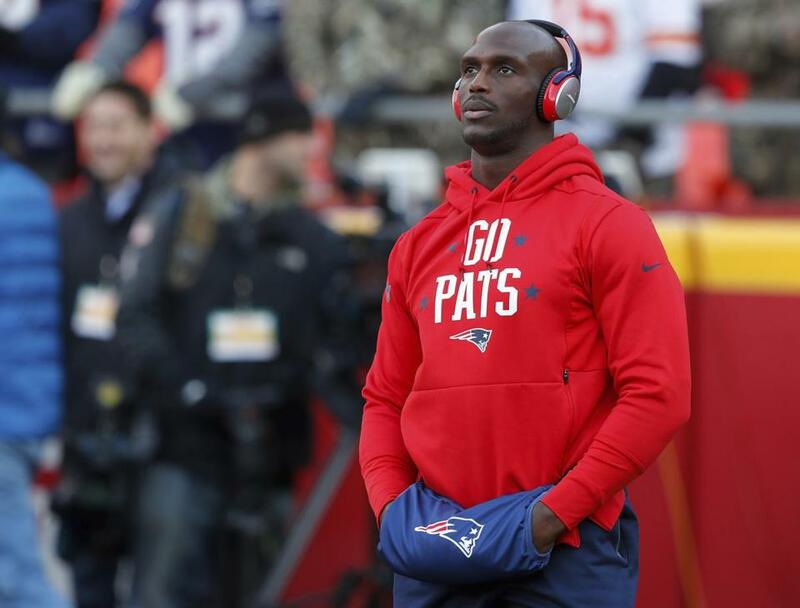 Patriots cornerback Jason McCourty warms up. For New England, DB Duke Dawson, DL Keionta Davis, OL James Ferentz, DL Danny Shelton, TE Stephen Anderson, DL Deatrich Wise, and DB Ufomba Kamalu. Despite being taken off the injury report this week, Deatrich Wise is INACTIVE. Patriots taking their chances against the run with Danny Shelton also INACTIVE. For Kansas City, LB Dorian O’Daniel, OL Kahlil McKenzie, OL Jimmy Murray, OL Laurent Duvernay-Tardif, WR Kelvin Benjamin, TE Deon Yelder, and LB Tanoh Kpassagnon. Safety Eric Berry is officially active. KANSAS CITY, Mo. 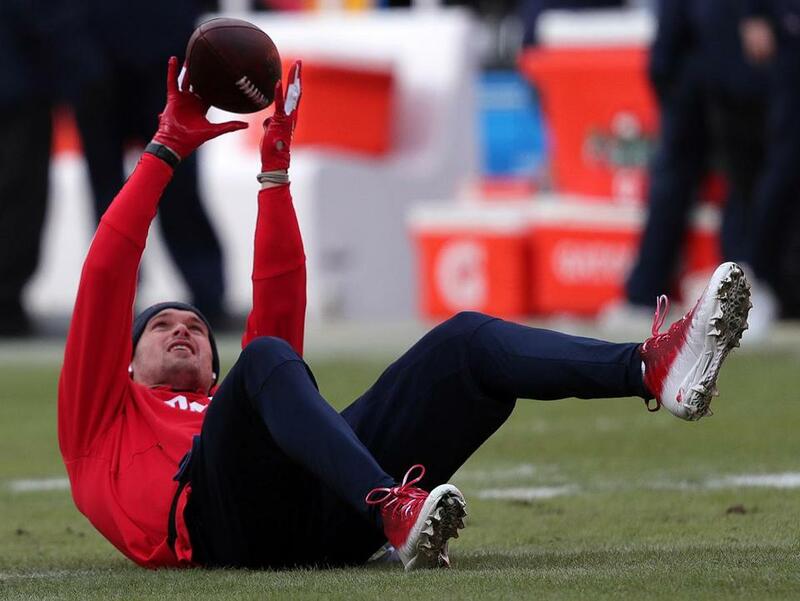 – It didn’t turn out to be quite as cold as forecasts predicted earlier in the week (score one for weatherman skeptic Bill Belichick) but it was still below freezing on AFC Championship gameday in Kansas City. 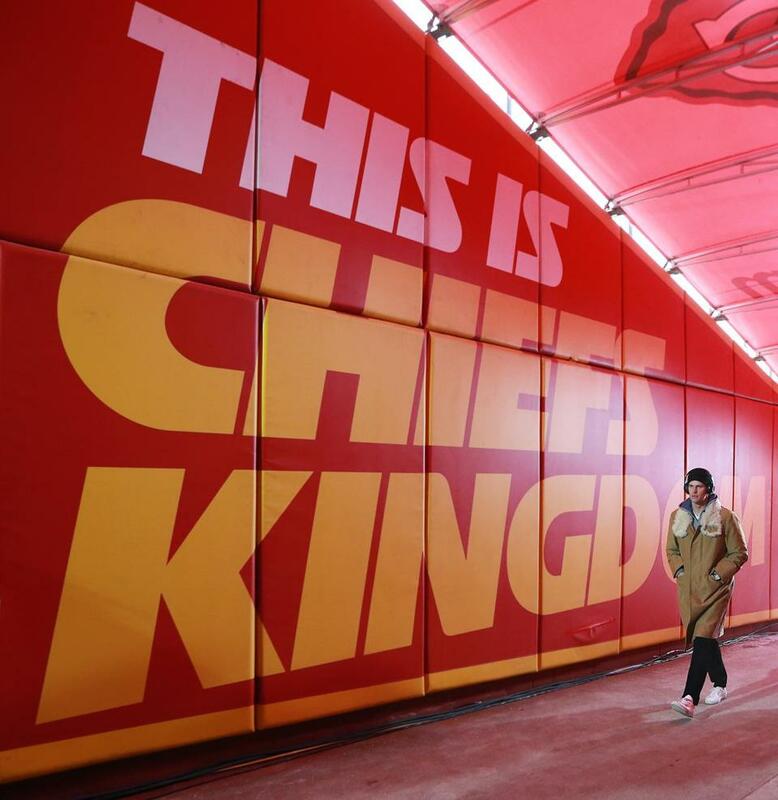 The field at Arrowhead Stadium, though, is kept relatively warm, thanks to a North Andover company that designed the underground heating system that keeps it from freezing. Watts Water Technologies developed the hydronic system that circulates hot water in a network of pipes stretching from end zone to end zone below the grass. Three of the company’s Benchmark boilers warm the water, which keeps the grass just warm enough to avoid freezing. Watts has also outfitted Red Bull Arena, the stadium for the New York Red Bulls MLS team, and several soccer venues in Europe with similar heating systems. It’s an interesting local connection as well as a factor in the Patriots’ preparations for the AFC Championship game. Teams always know the surface they’re about to play a game on, and take into consideration how it’s maintained and likely to feel like on gameday. Patriots players were warned during the week that the freezing temperatures could lead to issues with footing on the natural grass field. It’s harder for cleats to get good traction on frozen ground, which is an issue for any team but especially one like the Patriots that runs the ball and asks its linemen to pull and clear out space for the running game on a regular basis. Those kinds of blocks require a firm base, easier when there’s good footing. Frozen turf, of course, is also an injury risk. “There’s definitely differences and there’s some things that can affect us and we try to take those into consideration ahead of time. Sometimes those things don’t become apparent or they don’t declare until you actually get to the game. Sometimes it changes during the game and you have to make that adjustment,” Belichick said. ■ The Patriots would love to start Sunday’s game the way they started against the Chargers. Playing from behind against the Chiefs is rough. Kansas City is plus-91 in first-quarter scoring, best in the NFL. Andy Reid’s track stars have scored first in 13 of 17 games. The four times Kansas City fell behind first it went 2-2, both wins coming against rival Denver. ■ The Patriots are plus-15 in first-quarter scoring. ■ The home team has won five straight AFC Championship games. ■ Chiefs fullback Anthony Sherman went to North Attleborough High. ■ KC’s director of football operations is Everett native Mike Borgonzi. ■ Julian Edelman’s 403 punt return yards (on 34 attempts) is tops in NFL playoff history. ■ Sony Michel (three TDs in the divisional round) can tie the postseason record for most rushing touchdowns by rookie with just one score Sunday. He would share the record with five other backs. ■ With a win, the Patriots will reach their third straight Super Bowl, joining the 1990-93 Bills and 1971-73 Dolphins as the only teams to make three consecutive Super Bowls.
? The Patriots have played the league's No. 1 offense 12 times since 2001.
? They are 8-4 in those games, including 4-1 in the postseason. 1. Tom Brady never hit the turf last week. If he has a clean shirt after this one, the Chiefs are going on vacation. Justin Houston, Dee Ford, and Chris Jones have to get him down. 2. They must hang onto the ball. Giving the Patriots extra chances is a formula for disaster. For all the excitement Patrick Mahomes generates with his crazy, contortionist passes, better safe than sorry. 3. Returners Tyreek Hill and Tremon Smith are electric. If they can keep the field — and the subsequent drives — short, it will keep this offense fresh for four quarters. 1. Mahomes has insanely quick feet, so using a spy as a second level of pressure when he starts to scramble makes sense. Dont’a Hightower and Kyle Van Noy, you’re up! 2. Getting the ball into James White’s hands so he can work his magic against inside ’backers Anthony Hitchens and Reggie Ragland (hint: they can’t catch him) is a must. 3. Play man defense — Stephon Gilmore on Sammy Watkins, J.C. Jackson on Tyreek Hill, Patrick Chung on Travis Kelce — to keep Mahomes’s windows tight. He’ll hit some of them, but you can’t make it easy on him. Check out his full scouting report. ■ Why do the Patriots run into trouble when they’re on the road? Princiotti examined a number of factors and talked to Tom Brady, Brian Hoyer, and Shaq Mason to try to find out. ■ Why the Chiefs use run-pass options so much, and how the Patriots can stop them. ■ Film Study: How the Patriots should defend against Mahomes this time around. ■ Film Study: What to expect from the Chiefs’ defense this time around, and how the Patriots should attack it. 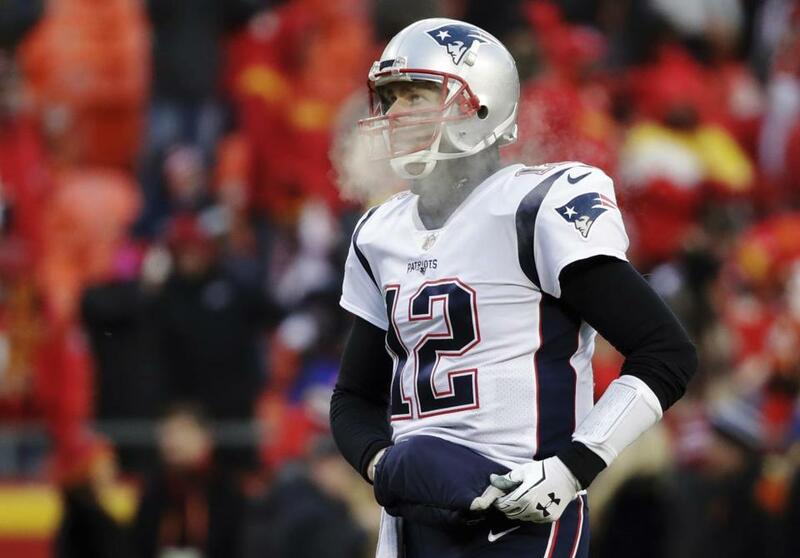 ■ How Brady and the Patriots have fared when it’s 20 degrees or colder. ■ Here is Chad Finn’s Unconventional Preview for this matchup. Three players not named Brady to watch? Patriots defensive end Trey Flowers, the cornerback Jackson, and Chiefs defensive tackle Chris Jones. ■ Is Patrick Mahomes one of a kind, or the beginning of a new wave of quarterbacks? Jim McBride of the Globe staff contributed.